Our Thiells Pest Control Exterminator will identify the source of the pest infestation & create a customized treatment plan to eliminate the pests. 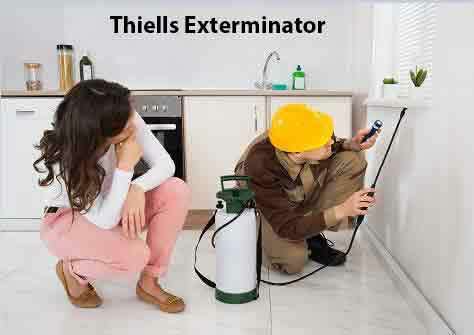 Let us be your Thiells Exterminator, give us a call today 1-844-305-8999. While honey bees can attack when provoked, wasps are naturally and more aggressive predators. Identifying the difference between honey bees and wasps is important in order to administer proper treatment of wounds and appropriate pest control. Wasps and honey bees are both members of the Hymenoptera order of insects. If you attempt to exterminate Stinging Insect pests yourself, you could literally spend hours shopping for costly pest control sprays or trapping devices. You could then spend even more time trying unsuccessfully to kill the wasps or bees, putting yourself or your family at risk in the process. A professional exterminating service can take care of your pest problem efficiently. Spider Control and extermination can be a major concern for homeowners. If spiders are infesting your home, contact our Thiells Exterminator at Dependable Exterminating for a spider control professional. Spider exterminators will be able to inspect your home, confirm the species of spider and recommend a course of proper spider control. Our trained technicians have expert knowledge about spider species and spider control. We can offer advice on how to spot the early signs of an spider infestation, to enable quick and effective targeted treatment for your home or business. Dependable Exterminating is a full service Spider Exterminator. More than 100 pathogens are associated with the house fly, including Salmonella, Staphylococcus, E. coli and Shigella. These pathogens can cause disease in humans and animals, including typhoid fever, cholera, bacillary dysentery and hepatitis. Flies, typically considered a nuisance, exist in all regions of the United States. There are more than 240,000 different species of flies in the world. Approximately one third of them, including mosquitoes and gnats, can be found in the United States. The most common flies are the Blow Fly, Fruit Fly, Drain Fly, Flesh Fly, House Fly, Cluster Fly, Horse Fly and the Crane Fly. See our Fly Chart on our Fly Pest Library Page.